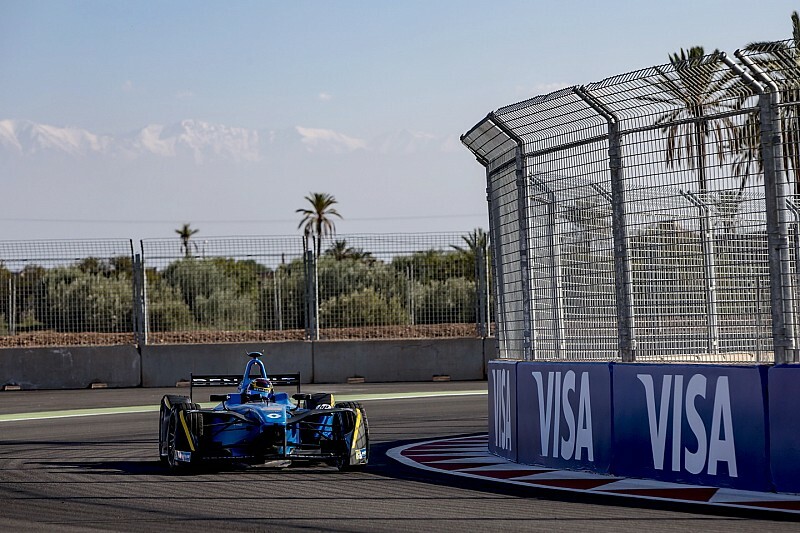 Sebastien Buemi was victorious in the second round of the Formula E championship season in Marrakesh, fighting back from seventh on the grid. 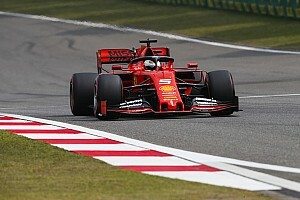 The reigning champion, who took a five-place grid penalty for being underweight, reeled in long-time leader Felix Rosenqvist with six laps to go, and made a decisive move to ensure he stretches his lead in the points standings to 22 over rival Lucas di Grassi. 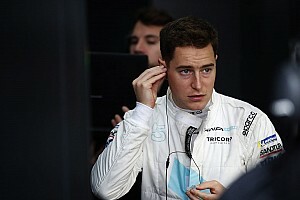 Sam Bird was also able to pick off poleman Rosenqvist in the closing stages to claim second position, taking the first podium of the season for the DS Virgin squad. Rosenqvist finished in third place to seal a second consecutive podium for Mahindra. 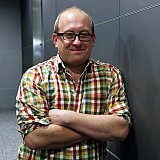 The rapid Swede was impressive all weekend, but was unable to repel the duo in the final stages. Nicolas Prost again finished in fourth position to cap a fine day for Renault e.dams, with the French team's two cars inside the top five. Di Grassi finished fifth ahead of Abt Schaeffler Audi Sport teammate Daniel Abt in sixth and Oliver Turvey, the British driver scoring points for the second race in succession. Jean-Eric Vergne cut a forlorn figure after a seeing a potential victory charge end when he received a drive-through penalty for speeding during his mandatory car swap pit stop. The Techeetah driver slowed in the final portion of the race and took eighth position to at least claim the Chinese-owned team’s first-ever points in Formula E.
Nick Heidfeld ensured a double points finish for Mahindra in ninth, while DS Virgin's Jose Maria Lopez notched up his first point in the all-electric series in 10th. Polesitter Rosenqvist made a superb start and led the field into Turn 1, but he was soon suffering dash-related problems, which limited his view of the important information relayed to him. It seemed to make little difference though as the Mahindra rookie sprinted away and opened up an impressive two-second gap to Bird after four laps. Behind Rosenqvist, the field was largely in grid order, although the Renault e.dams drivers swapped positions as Prost made his teammate's life easy by allowing Buemi through at Turn 7. The battle for third position warmed up after seven laps, when Vergne started to pressure Nelson Piquet Jr. It paid off on lap 9, when Vergne slipped down the inside at Turn 1 with a textbook manoeuvre. Abt’s fifth place came under threat on lap 8, as Buemi made a solid move down the inside of Turn 10. The Swiss champion immediately set after fourth-placed Vergne, setting the fastest lap. Prost followed teammate Buemi through and past Abt on Lap 10 into Turn 1, as Abt was then forced to defend from a marauding pack which included Turvey, Antonio Felix da Costa and di Grassi. By lap 12, Buemi was all over Piquet Jr and the Renault e.dams driver made short work of the Brazilian with another slick move at Turn 7. The first Full Course Yellow threatened to come on lap 12 when da Costa stopped his Andretti machine at Turn 8. 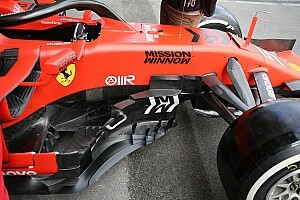 However, the Portuguese rebooted his car and was able to re-join. 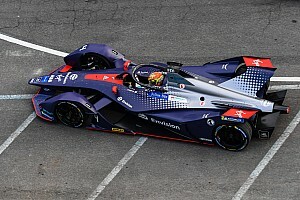 Da Costa went on to set the fastest lap of the race with a 1m23.098s lap, but was pipped by Loic Duval who salvaged a point for the Faraday Future Dragon Racing after a miserable weekend. At the front, Rosenqvist had a comfortable lead to second-placed Bird; the gap expanded to almost five seconds by lap 14. Bird was forced to defend from a charging Vergne, who was being backed into the equally quick Buemi. Vergne was through into second position at the start of lap 16, with Bird choosing not to defend the position but able to keep within close to the Techeetah driver’s rear wing. The first pit stops came on lap 16, with race leader Rosenqvist, Vergne and Piquet all changing cars. Bird and Buemi elected to continue for a further lap, but Buemi was quicker and nipped past the DS Virgin driver at Turn 11 on his in-lap. 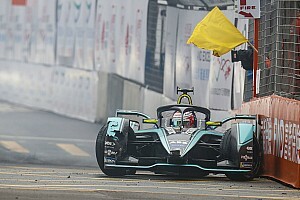 After the pitstop shakeout, the order was Rosenqvist, still with most of his four-second lead intact, Vergne, Buemi, Bird, Prost, Abt, Turvey and di Grassi, who watched in frustration as the NextEV car got back ahead. The Brazilian soon made it back through though, and set after teammate Abt in sixth position. Vergne was placed under investigation for pit lanespeeding shortly after his stop, and soon news came that the Techeetah driver would receive a drive-through penalty. A late charge from Buemi came in the closing stages, and the championship leader got right to the back of Rosenqvist's Mahindra car after using his FanBoost. The move for the lead came on lap 27 at Turn 11, and Buemi easily took the lead and stretched away to his second consecutive win. Bird also caught the energy-sapped Rosenqvist. With slightly more energy to play with, the DS Virgin driver applied monumental pressure before taking the position at Turn 7 with just two laps remaining. The battles in the late stages came for fifth position, after Vergne fell back behind Prost’s Renault and was under pressure from a flying di Grassi. The two made brief contact at Turn 10 before the Abt Schaeffler Audi Sport driver made it through to claim a hard-earned fifth position. Vergne dropped down the order to eighth place behind Abt and Turvey to cap off a frustrating weekend for the former Toro Rosso driver.